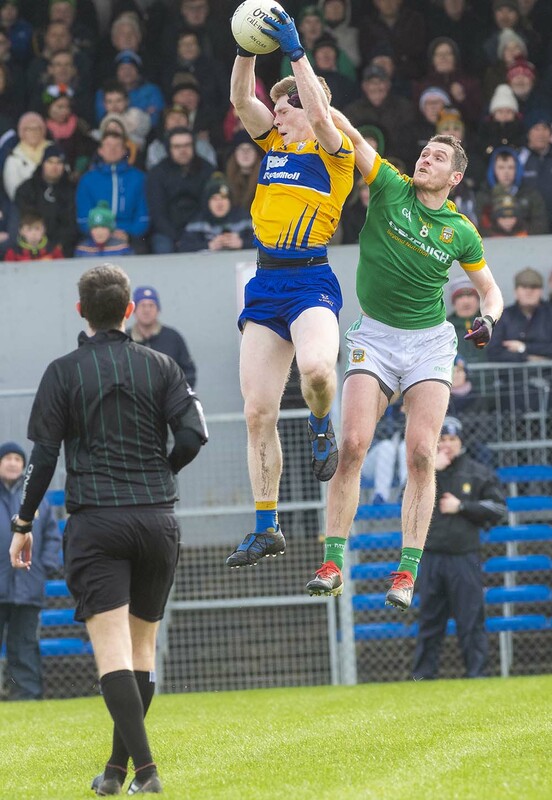 Clare's Sean O'Donoghue jumps higher than Meath's Bryan Menton to win the kick-out. Photo by Eugene McCafferty. Meath pulled away from Clare to earn the two points in a strong second half display in Cusack Park. Meath controlled the game early on and found themselves 0-5 to 0-2 up after 14 minutes courtesy of two Thomas O’Reilly points and scores from Ethan Devine, Darragh Campion and Cillian O’Sullivan. Clare did eventually warm to the task and Gavin Cooney as well as an Eoin Cleary free got Clare off the mark. Clare were playing into the teeth of a very strong breeze which did make life quite hard, especially from kick-outs. So when they were only two points behind in the first quarter after Cleary added his second free, it was far from calamitous. Clare eventually got to grips with the elements and moved the ball quite well through the lines with Cian O’Dea and Gary Brennan doing a lot of the hard running. David Tubridy then got on the scoreboard from a free before O’Sullivan cancelled it out soon after with his second point. Then in the 29th minute Jamie Malone broke down the right wing and played a lovely hand pass into the path of the on-rushing Seán O’Donoghue who composed himself and blasted the ball into the bottom left corner of the net to give Clare the lead for the first time. It was a fleeting lead though as Michael Newman converted his mark from close to goal and sub Barry Dardis finished off the half’s scoring to leave Meath 0-08 to 1-4 up at the break. Scores were hard to come by in the second half with one free each the only scores in the first 15 minutes before the defining moment of the game came in the form of a Graham Reilly goal for Meath. He fisted to the net from a yard out after being played in cleverly by Barry Dardis. A lovely team move to knock the wind from Clare’s sails with a quarter of the game remaining. Meath had all the momentum after this and two frees from Newman pushed them 1-11 to 1-5 clear with ten minutes remaining. Cleary added two more frees and Cillian O’Sullivan bagged his third point from play but Clare were comfortably accounted in a strong second half display from Meath. Clare: Eamonn Tubridy; Kevin Harnett, Cillian Brennan, Gordon Kelly; Dean Ryan, Aaron Fitzgerald, Cian O’Dea; Gary Brennan (c), Cathal O’Connor; Kieran Malone, Seán O’Donoghue, Jamie Malone; Eoin Cleary, David Tubridy, Gavin Cooney. Meath: Andrew Colgan; Seamus Lavin, Conor McGill, Ronan Ryan; James McEntee, Donal Keogan (jc), Shane Gallagher; Bryan Menton (jc), Shane McEntee; Cillian O’Sullivan, Ethan Devine, Darragh Campion; Bryan McMahon, Michael Newman, Thomas O’Reilly.